I hope you are all having a great week. I have started it a bit tough and had an important appointment yesterday. I was hoping that things would calm down after that but I was wrong. It turned out that I have another important appointment in a month and I have to get prepared! Not to mention that I have a deadline in a week. Oh have I forgotten, I am also going to give a lecture to a class of girls because I am an avid girls in technique promoter and that is in four weeks too. I wish I could clone myself and have a make-up twin who only concentrates on pretty things in life, can you relate? Although February might not be the most active month for Color Me Loud, I have lots of pretties lined-up, waiting to meet you. So stay tuned! 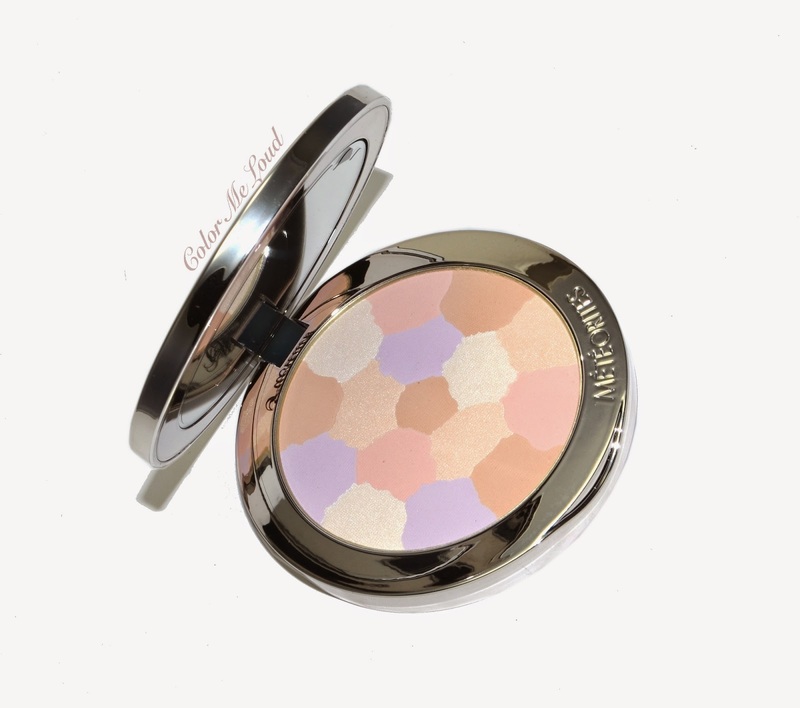 My favorite piece from Guerlain's Spring Collection is definitely Météorites Perles de Blush (reviewed here).Each time I wear it and post a photo, I am asked which blush it is since it looks so natural. It does and even better, it stay put all day long! I have heard that some are turned off by the cardboard packaging. I personally like it, it is not designed to travel with but it is light weight and looks so cute. I have acquired a few pressed Meteorites recently and haven't used them all that much so the new Météorites Compacts were not must-have for me. But blogger duties called and I ordered one just for experimental reasons. Today I would like to share my thoughts about how this one compares to the previous releases. What I really like about this release is that, there are three new shades so one doesn't have to look like a snow queen. There are options. The classical Météorites Compact is rather white. I was hoping for something a little warmer but which would still brighten up my complexion, so I went for #03 Medium. Medium has beiges, lila and mauve inside but as you know these don't swatch as they appear in the pan so no panic, you won't end up with a lila face. Since the effect of compacts are really subtle, I believe the best way to define and show it is to show how it is next to other similar compacts. Therefore I have pulled out Wulong from Holiday 2012 and Crazy 68 from Holiday 2013 out of my stash. 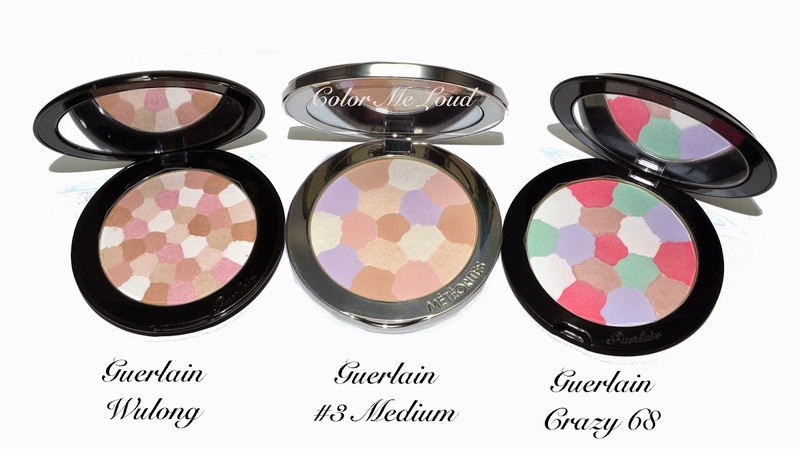 Just that you know, Wulong is one of those "oh so pretty but oh no so expensive" compacts Guerlain brought out. It has a solid metal and refillable compact. I was pondering about it then it sold out and I started having skippers remorse. I have then bought the one which was on the display at Breuninger but couldn't bring myself to use it frequently since I love it so much. Each time I put it on I end up loving the effect. Before I show you how they compare, I would like to talk about packaging. Obviously the best packaging is Wulong Compact with its heavy and luxurious feel. But does it worth 60 bucks? I don't think so. I ended up liking the plastic compact of Crazy 68 too. It has the same space ship form that Wulong and other Météorites have. The worst packaging have to be the one from the new compact. The thick edges don't look sophisticated. The metal looking plastic is not that pretty, picks up finger prints but doesn't feel luxurious. If I compare the look and feel of the three compacts, it is easy to see that #3 Medium is the warmest of them all. Wulong was slightly going to a natural rose, which was great for me wince I have natural undertones. Crazy 68 was way too pink for my liking but has a nice brightening effect. What I also notice is that Crazy 68 has an uneven surface but other two are pressed better. If I swatch them together in a very heavy fashion, you can notice some difference, which is there once used sheerly on the face but you can't pin point where it comes from. Crazy 68 and Wulong had very close finishes, almost matte with a few sparkle here and there. Unfortunately this pretty "finish" is changed similar to what Guerlain did with their Météorites (Ballz) as well. The finish is more frosty and way too warm. I use it drawing a large G on both of my cheeks. I like this compact on me but I have the feeling that Wulong works much better. Too bad that it was limited edition! Final thoughts: I appreciate the initiative of bringing a product to more people but packaging is rather thick and is in a plastic compact which looks like metal, not really my cup of tea. It seems #03 was a wrong choice too. It is way too warm, and the finish is changed, to be more (frosty) shimmery. Still if you haven't tried Météorites, it is a nice start. Do you have any compact Météorites? How do you use it? Seem just way too frosty to my taste. as a finishing powder I find it to be a little shimmery but of course it doesn't appear like that as I have shown on the face. Which finishing powder do you use at the moment? of course it looks much nicer when it is sheer. But as I have written, the effect is subtly there. Some would like a glow some less, it is a personal preference. Wulong should be brought back! Hi Sara, sorry to hear you're having a tough week! I'm not having an easy one either... severely sleep-deprived! I totally hear you about having a different twin! But thanks for getting out this review anyway. I'm not at all keen on more pressed ballz, and i agree with you that Wulong looked the best! I absolutely loved it on the face!! But I must warn you though, that Wulong disintegrates once you use more of it, as the diff patches wear off at diff rates, so after awhile, the jig-saw just falls apart! And it's non-refillable! Oh it does disintegrate? This is such a pity for something which was so expensive. I guess I shouldn't use it and watch it instead, it is so pretty. The case is fillable but the shade to fill it is just the regular one of course. Yeah, looking at that swatch I am not convinced either. It looks very frosty indeed. I definitely prefer Wulong. Didnt realize the case was plastic! Kind of disappointing. My compact is the Voyage one, a fully metal one that isn't all that portable since it's so heavy, but it feels collectable at least. You are so right, Wulong feels luxury but yes it is very heavy too. I actually have Claire and don't find it too frosty at all. When I use my brush, it produces a similar effect as my loose ones do. When I swatch the pressed ones with my finger, they do look a tad light and opaque, but thankfully they don't look that with a brush. I know what you mean, though. I'm not completely in love with my compact and don't find it easier to use than the loose version. It's just easier to travel with, but that happens only a few times a year. All in all, I still like my loose ones more (love the sound the balls make when they tap against each other) and completely regret not buying the Wulong! I also love the balls more but the new ones have even more shimmer than the older ones. If you like a little bit of glow on the face no problem. I know what you mean with tapping ball sound lol, loved that one too! I was looking forward to your review of this ever since I saw you had it! I bought the Crazy 68 from Stacey second hand and I'm dying to try it, it does look very pink though now that I've read your post. You've done an excellent job comparing the three, you're always so thorough which I love of your posts! Great job! I personally like Crazy 68 more than #3 Medium since my complexion is a little dull and needs some pink in the finishing powder to bring it back to life. Once you apply it very sheer, it doesn't appear light but more brightening if that makes sense. I think they just look different on everyone. I mean I have the same shade as you (Medium) of new ones and they don't look frosty on my face and I can't see any shimmer. Guerlain Aquarella is in my opinion more shimmery. Even the standard loose version is in my opinion little bit more shimmery (I have Medium and Clair from previous edition). I think the packaging is ok, I really like how it looks now, I didn't know it's plastic tho, because when I hold it it's quite heavy, but still I think for the price it's not so bad. It's just a little bit differend than the old one was, so maybe we just got used to the old design? I also think balls are more shimmery than he compact but this compact is a little more shimmery than the previous ones, just like the new balls were more shimmery than the old ones. Some liked it some didn't. It is just personal preference. You are certainly right about getting used to the design, I was expecting the UFO design lol. 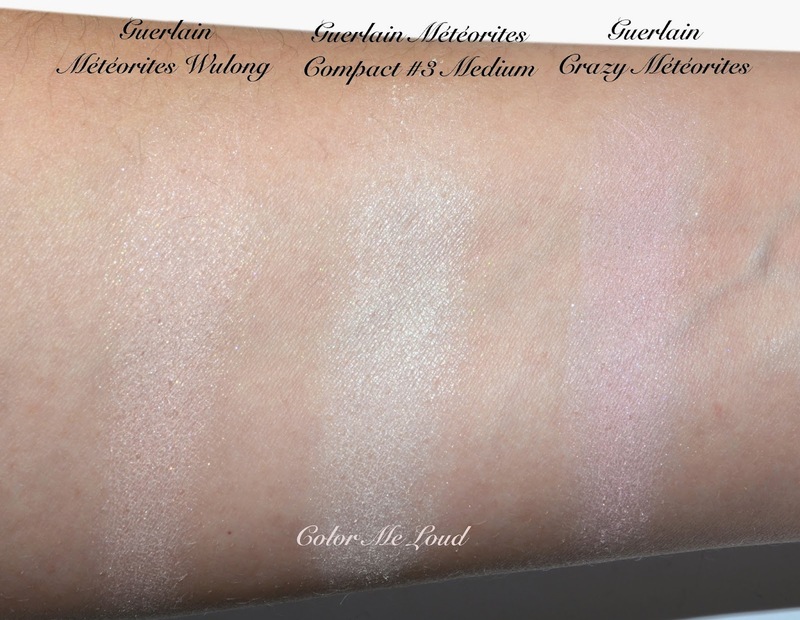 I think the frosty impression some of you are getting is because Sara has swatched the powder heavily in order to show the undertone. If she had swatched it the way it would normally be applied, you wouldn't see it! LOL Météorites are finishing powders and are normally applied as a very light veil of powder to illuminate the complexion and tie everything together. If someone looks frosty, it is because they've selected the wrong shade or they're applying it way too heavily. BTW, I'm NC15 and 02 Clair is perfect on me. I'm a huge fan of the Météorites pearls but I also have the two compacts--Wulong (my fave) and Voyage--for those times when I know I'll need to touch up at some point. 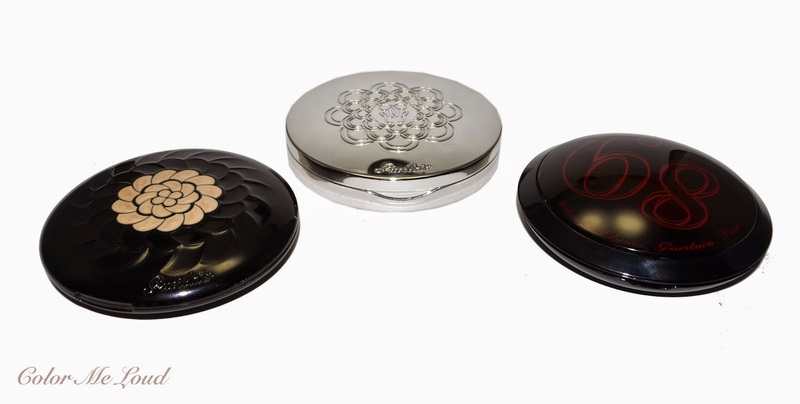 Both are beautiful powders but the cases are quite heavy and can really weight down a purse! It's ironic that Voyage was originally marketed as a travel option because it is not really travel friendly from the standpoint of weight. Anyway, I bought the new compact specifically for travel and have been very pleased with it. Yes, the case is plastic, but it is not flimsy, and the lighter weight is a definite plus when it comes time to toss it in a purse or carry on. 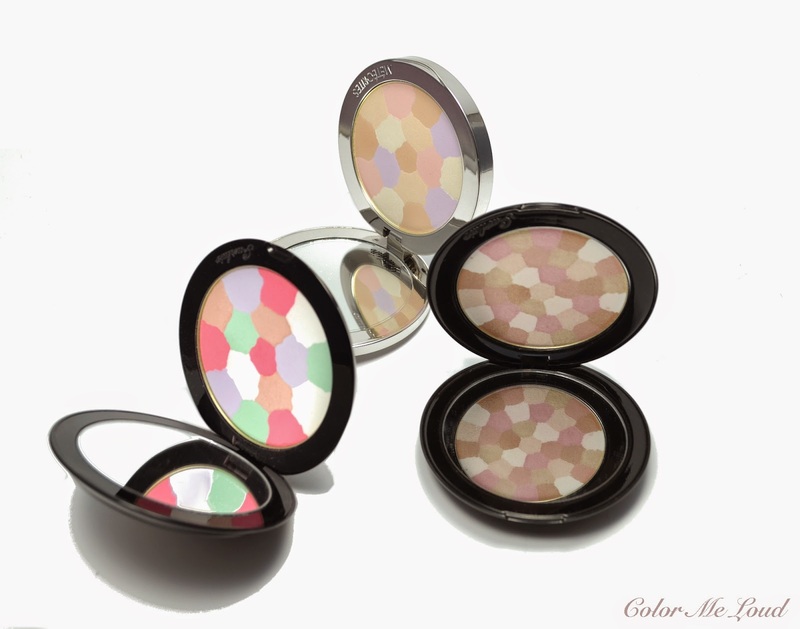 The three compact shades correspond to the three pearl shades that were released last year. I wear 02 Clair in both the compact and the pearls. you are right, I had to swatch it extremely heavy to see the difference in undertones. I have also written above once sheered out, you don't see that it is shimmery but there is a difference between this one and Wulong on the face if you look carefully. I think #03 Medium was a wrong choice for my now even a little under NC20 complexion. It is a little too warm and it doesn't have the rose I need to brighten up my dull complexion. Instead it warms it up but I am not sure if I needed that so much. I also agree completely on the portability issue, this one is very practical to take away, the others are a bit heavy. I don't reapply powder throughout the day though, so this aspect will be helpful only when I travel. Thanks for stopping by. Ah, thank you for the clarification! I usually translate warmth as meaning too dark on me, so I think I will test it out in stores before purchasing. Thanks again! Where can I purchase it from.online? 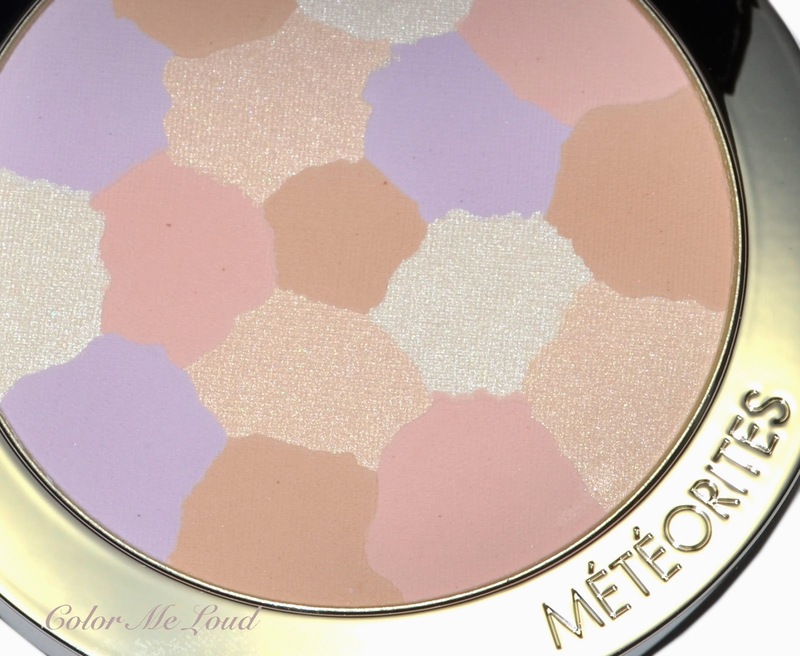 I'm pretty much obsessed with Guerlain's meteorites, and I bought the compact in Light. There's just something about these powders that make me look flawless, especially in photographs.